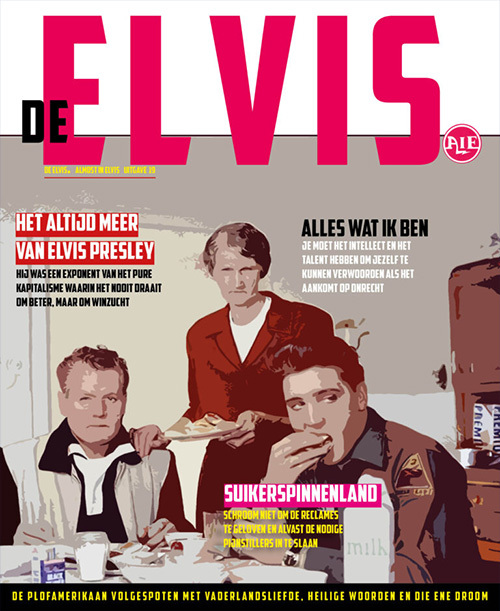 The very irregular Dutch magazine Almost in Elvis has a new issue: Nothingville.The 18th edition is a report of a trip through the US; before, during and after Elvis’ life, partly fiction, partly fact. It is almost a novella and good for a few hours of reading pleasure. That is if you understand the Dutch language (and humour). Regular occasional authors give their view on people (Parker, little miss Prissy) and places having to do with Elvis and of course there is another review of the album that gave this series its name: Almost in Love. The magazine is stylishly decorated with pictures in old fashioned newspaper style.